Lawnmowers keep the grass in tip-top condition, making it usable and presentable; but like everything else lawnmowers succumb to certain faults. To learn more about these, read on as we at The Mower Shop explain more about the common problems typically associated with lawnmowers and how we can help you get your lawnmower working again with our lawnmower repair service which is available to those in Leicester. When you come to mow the lawn and the lawnmower won’t start you could be forgiven for thinking that you’ll need a completely new lawnmower. This isn’t always the case, and in actual fact, we at The Mower Shop are more than able to repair the lawnmower on your behalf. This could be due to a number of things, from having a faulty on/off switch to jammed blades. However it could mean there is a problem with the engine. If the engine is overheating it could be caused by a number of things – including blocked air filters. To identify the problem its worth bringing your lawnmower to the experts here at The Mower Shop as we have the experience and expertise to repair the fault. 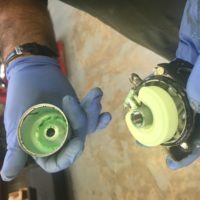 If the motor keeps cutting out then this could be due to the motor overheating, the blades are clogged with grass or the cooling fan is broken. Lawnmowers are an expensive piece of equipment so it makes financial sense to repair the lawnmower rather than replace it. This could be due to blunt or twisted blades, or dirt beneath the blades themselves. Before you check whether this is indeed the case you need to turn the engine off and disconnect the lawnmower from the mains if it’s an electrical one. Once you have done this carefully turn the lawnmower over and place it back on the floor – this will give you a clear view of the blades. If you are not sure what you are looking for, bring it in to see the professionals here at The Mower Shop. For lawnmower repairs in Leicestershire make sure you call us today on 01788 510 453.